If you are one of our Facebook friends or a newsletter member you have probably already heard the news, but let me tell you a little more about it. Shipwreck Beads is hosting a DESIGN CONTEST! 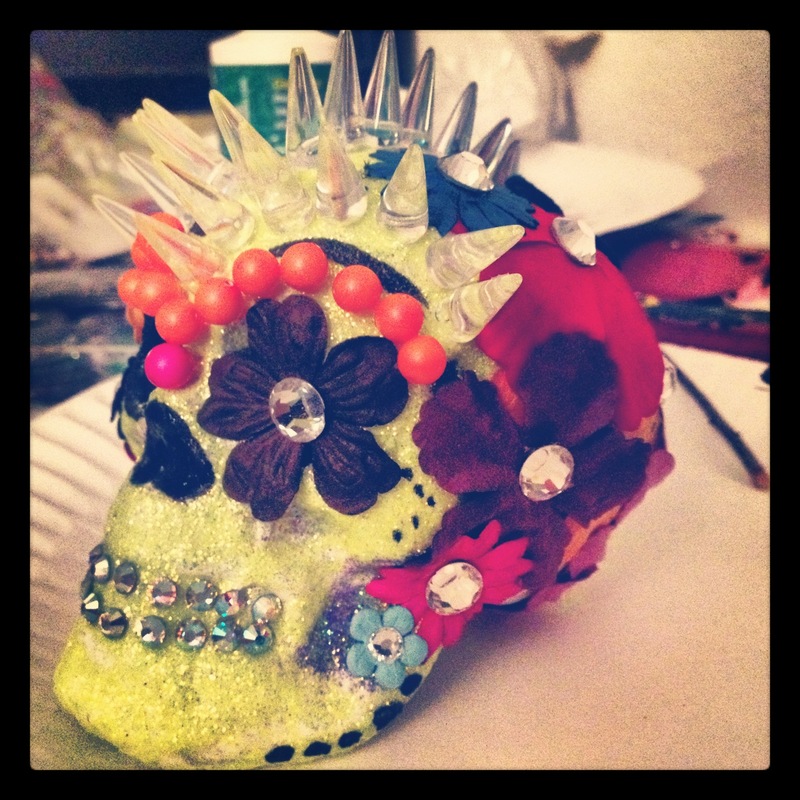 We want you to create a sugar skull using beads (of course!) and whatever else you would like. Your creation can be either 2 or 3 dimensional and in any style you wish. Get as creative as your heart desires! The submission deadline is October 19th, so be sure to get your entry in fast! In preparation for this event, our design team (including yours truly) each created a skull of our own. 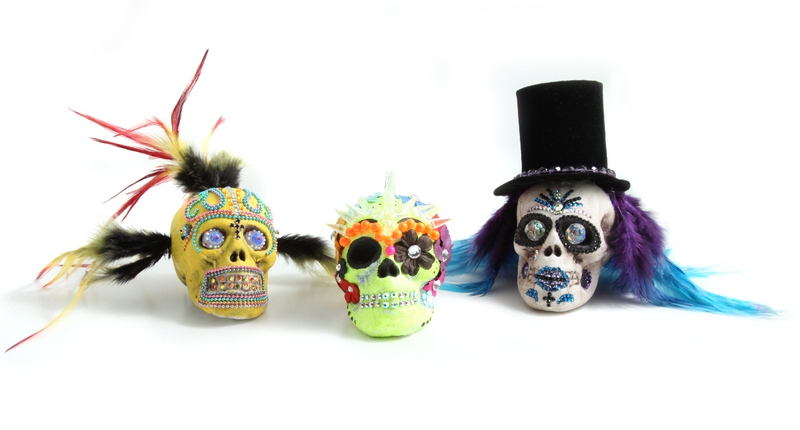 We use foam skulls from the Halloween section of our favorite department store. Take a look at our designs! My creation is the one in the center. Although its hard to tell from this picture, I used neon yellow glitter, these cool new spike drop beads, neon pearls, Preciosa flat back rhinestones, and an assortment of scrapbooking flowers. The others were created by two very talented creative team members. They both chose to incorporate feathers and the flat back rhinestones with very different and awesome results. My favorite detail on the yellow skull is the way colored ball chain was used to create a swirling pattern and outline of the mouth. I just love the way the finished piece looks. And that top hat on the white skull? These black velvet jewelry bags! Construction paper was cut to size and then covered with the disassembled bags. The contest is already underway and the submissions are rolling in. I can’t wait to see what you will be coming up with. Tune in later this week to hear from another design team member, Carol, who will be documenting her sugar skull design process!